This article shows you how to post to your blog and include a link/button to your artwork’s DPW page so people can buy your work with the DPW auction or PayPal link you set up. Sign into DPW, go to your Art Tracking grid, and click the Pull Post button to pull in the just created post. This step assumes you have entered your blog’s feed URL in your Account Info page. You should also be sure to turn off the blog auto-pull feature in your Account Info page. You can also manually upload your artwork into DPW using the Upload Wizard by clicking the button above your Ar Tracking grid. Create the DPW Auction or DPW generated PayPal link for your artwork using the little gavel and PayPal icons in the left-most column of your Art Tracking grid. Click the little link icon to open the Links to your Artwork window and copy and paste either your artwork’s URL or link/button code into your blog post, replacing the placeholder text. Posted - Tue, Apr 26, 2011 at 8:49 PM. This article has been viewed 10333 times. How do I mark my paintings as sold? How do I set up Sales Tax to be automatically calculated? How is the Internet Changing Art Pricing? 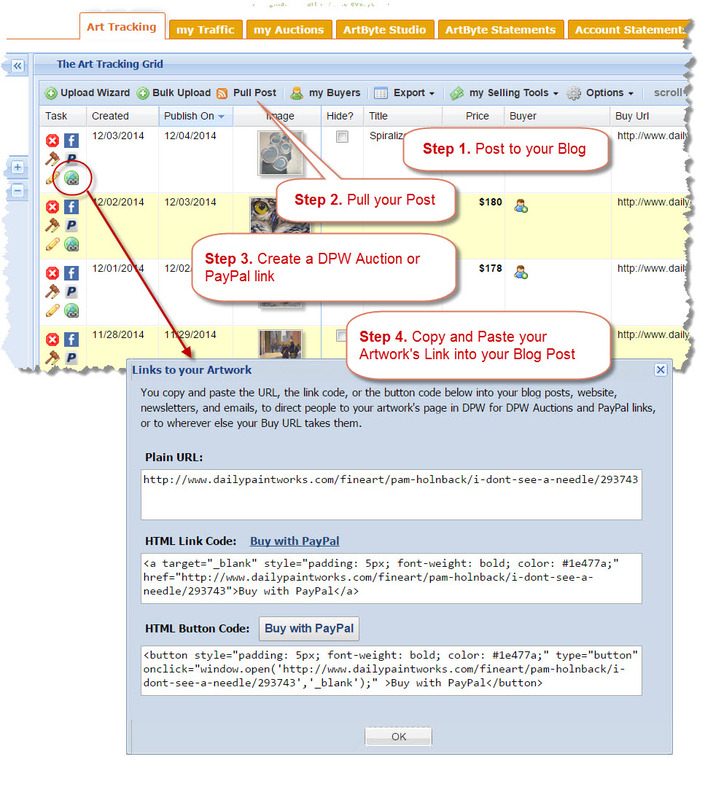 How to add a DPW Auction link to your Blogger post. If I Join DPW, do I have to only use DPW Auctions? My painting sold, how do I contact my buyer? My painting sold, now what? What are DPW Auctions and how much do they cost?